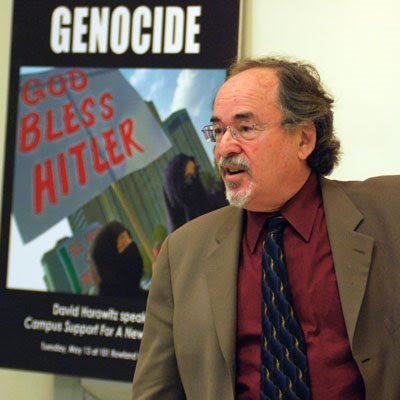 David Horowitz, a prominent neo-conservative writer, activist and founder of the David Horowitz Freedom Center, claims that UC Irvine’s Muslim Student Union supports terrorism against Jews. Photo: Sandra Lee. Earlier this month, the jury in Ward Churchill's civil trial against the University of Colorado found, in his favor, that the university had fired him because of critical remarks he made after the terrorist attacks of September 11, 2001. While Churchill awaits a hearing on his ongoing employment at the university, this victory is something to celebrate and replicate. At the same time, however, the noxious weeds of the new McCarthyism have begun to bear bitter fruit around the country. Reports are coming in, not just about the better-known cases of harassment and firing of Norman Finkelstein (denied tenure at DePaul and banned from a speaking engagement at Clark College) or Joel Kovel (recently fired from his position as the Alger Hiss Chair of Social Studies at Bard College). Many readers will know the horrific case of Sami al-Arian, the University of South Florida professor jailed for five years without basis or charges for the suspicion of ties to terrorism. Fewer people will know the names of four other targets of the Right's attack: Margo Ramlal-Nankoe, William Robinson, Nagesh Rao, and Loretta Capeheart. All four face harassment, threats, or potential removal from their jobs at their universities because they have criticized Israel, defended multiculturalism, and stood up as organized employees in defense of their rights as workers. This rash of cases comes, not coincidentally, during an upsurge in college activism, from counter-recruitment demonstrations to the student occupation at NYU, from the struggle for gay civil rights to the demand to boycott, divest from, and sanction Israel. University campuses have always been spaces for young activists and critical scholars to demand change. In his lecture, he spouted offensive nonsense: for example, that racism and sexism were not barriers to achievement, that renowned critical race scholars Cornel West and Michael Eric Dyson were "buffoons" and third-rate intellects, that gender is entirely biological (and therefore so is women's inferiority at math), that Sami al-Arian is a terrorist, that support for Palestine is anti-Semitic, and so on. He also used the podium to attack me as an alleged indoctrinator of students; when I rose during discussion to make the point that my activism is separate from my teaching and that he should respect students (about whom he is ostensibly so concerned) enough to know that they can think for themselves. This intervention was met with a diatribe, along with the accusation that my appearing so reasonable is a consequence of my skill at manipulation and deceit. The protest and Horowitz's column have garnered opprobrium from both hard conservatives and liberals, who argue that confronting Horowitz and those of his ilk is an act of censorship. But if Joe McCarthy rose from the dead chanting "I have here a list" -- or in Horowitz's case, three books and a website -- would they shout him down before or after he ruined hundreds of people's lives and careers? Those targeted by Horowitz, it seems, are expected to listen politely to his lies and distortions. However, left unchecked, the chilling climate that Horowitz and others have wrought is resulting in real damage to the lives and careers of talented scholars and conscientious teachers. His state-by-state campaign for his Orwellian-named "Academic Bill of Rights" has prompted numbers of universities -- most recently the College of DuPage -- to adopt vaguely-worded and potentially repressive codes of conduct that could be deployed arbitrarily against faculty who teach from their own philosophical perspective or bring political matters into classrooms, even when relevant. AAUP President Cary Nelson called the decision "a disaster for education in a democratic society." Why, as the ground is shifting under the Right and the country moves to the Left politically, are we seeing this proliferation of attacks on academic freedom? John Wilson, founder of the Institute for College Freedom, explained, "The Right lost so badly that its representatives are looking for easy targets. They see the campus as a place where they can retrench," he said. In addition, Wilson said that because state budgets are in currently in desperate shape, administrators of state universities see expendable targets in area studies (women's studies, labor studies, Middle-Eastern Studies, Latin-American Studies, African-American studies, and the like), roundly condemned by Horowitz as non-scholarly indoctrination factories. In reality, these are the programs fought for and won during the 1960s and 1970s that opened up universities to the voices of the marginalized. The coming to fruition of a decades-long assault on academic freedom (in the name of academic freedom) is the context for the repression faced by critical and activist faculty today. Faculty who have spoken out against cuts in area studies, in defense of minorities and activists on campus, or as part of their union or other organizations are particularly at risk today, as are critics of the state of Israel. Opposition to scholars who expose and critique the treatment of Palestinians by Israel has been front and center in the cases against Professors Margo Ramlal-Nankoe and William Robinson. 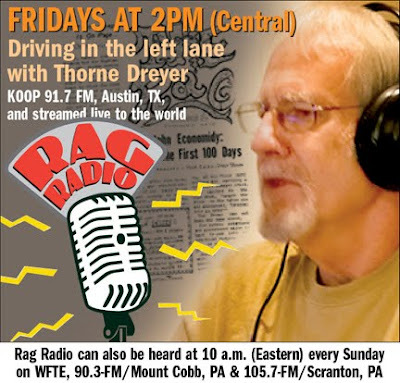 A tenured professor in her department revealed racism behind their decision as well: "We had little or no expectations of her; she is after all a woman of color," he wrote in a letter to the Sociology Tenure and Promotion Committee at Ithaca College in 2005. Despite the campaign being waged against her, Professor Ramlal-Nankoe's tenure review file is full of glowing letters from her students and colleagues. The Chair of the Sociology Tenure and Promotion Committee summarized the content of the numerous letters of support Professor Ramlal-Nankoe received from her students: "Most students tell us that working with Dr. Ramlal-Nankoe has transformed their views, their life, and/or their plans for the future." The letters of support Professor Ramlal-Nankoe received from her peers also note her excellence. A typical faculty letter states that Professor Ramlal-Nankoe provides a, "superior example of pedagogy and of the teaching of traditional sociology." With the evidence of such support, Professor Ramlal-Nankoe has concluded, "I believe the underlying basis for the violations against me stem from a discriminatory bias towards me, especially in regards to my political views on the Israel-Palestine conflict. Violations of human rights and the subjected condition of the population in this area of the Middle East have long been a matter of concern in my teachings and other work. Faculty reactions to my involvement in activist organizations, such as Students for a Just Peace in Israel and Palestine and Ithaca Finger Lakes Interfaith Committee for a Just Peace in the Israel/Palestine Conflict, have been extremely negative and problematic, both inside and outside of the Sociology Department." Professor Ramlal-Nankoe's supporters have established a Facebook page for her case at www.facebook.com/group.php?gid=72989883399. Please write in protest to President@ithaca.edu. Professor William I. Robinson, a Sociology and Global Studies professor at the University of California, Santa Barbara, has been attacked by the Anti-Defamation League and two of his former students. In January of this year, he forwarded an email condemning the Israeli attacks on Gaza. The email was an optional read for students. Within a week, the ADL wrote him a letter charging him with anti- Semitism and sundry violations of the Faculty Code of Conduct. The Academic Senate Charges Officer then notified him that two of he students in the class to which he circulated the email had filed complaints against him. Acting for all intents like a co-complainant of the students, the Officer fabricated additional charges not raised by the students. The case against Williamson rests upon the assumption that any critique of Israel is evidence of anti- Semitism and that the Israeli-Palestinian issue should not be discussed in a class on globalization. These are nonsensical; a critique of Israel does not impugn Jewish people or Judaism, and of course the conflict between Israel and the Palestinians is a matter of concern for everyone interested in economic and political globalization. Proceeding with these charges serves only to sanction politically motivated attacks on academic freedom, including the freedom to criticize Israel. This case alongside others may chill those who wish to present controversial and critical subjects. The charges have reached the Committee on Committees, which is now in the process of convening a committee to assess the complaints. The campaign for Professor Robinson urges readers to 1) email the UCSB Chancellor and responsible authorities on campus to register your protest, and 2) sign the petition. Information and links are at sb4af.wordpress.com. Contact the Committee to Defend Academic Freedom at UCSB at cdaf.ucsb@gmail.com. Multicultural curriculum and diversity are at issuein the case of Nagesh Rao, an assistant professor and postcolonial scholar of English at The College of New Jersey (TCNJ), a public liberal arts institution. The English department's personnel committee rejected his tenure application and has recommended that he be denied reappointment. Those close to the case believe that there are multiple political factors involved in dismissing a fine teacher and researcher who was meeting all stated requirements for promotion. Since arriving at TCNJ four years ago, Professor Rao, who has a Ph.D. from Brown University, has taught courses that exposed students to world literatures and postcolonial studies. His students have consistently appreciated his classes for exposing them to knowledges that they would not otherwise have encountered. He is much respected and loved by his students for challenging them to think in new ways. Similarly, Professor Rao's publication record has matched or exceeded the output of previous, successful applicants for tenure in his department. He arrived at TCNJ four years ago with an established record of publication and has since published two articles in peer-reviewed journals, edited a book of interviews with the late Indonesian novelist Pramoedya Ananta Toer, and developed a detailed book proposal. His review letter the previous year praised his accomplishments and put him on track towards tenure if he published another article in the following year. He did so. Yet, the English Department's Personnel Committee voted unanimously to deny tenure to Professor Rao. The background for this decision is a dispute inside of the English department over the status of a multicultural literature course in the curriculum. Professor Rao chaired a group of faculty defending the course in a deeply divided department. The TCNJ student body is significantly diverse, but this diversity is not represented fully in the curriculum. Also troubling is the fact that Professor Rao is one of the few people of color on the Department of English faculty, and the only South Asian in a state with a significant South Asian population. The fate of the multicultural literature course, along with his career, hangs in the balance of this politically charged dispute. Professor Rao seeks the appointment of a new, independent, and transparent committee to review his case. There is a petition in support of Professor Rao at thepetitionsite.com/1/defend-dr-nagesh-raos-tenure-and-reappointment-at-the-college-of-new-jersey. For more information: defendrao.wordpress.com. If conservative administrators can't get away with openly firing critics of Israel and defenders of multiculturalism, they have another tactic at their disposal. Some university leaders are attacking outspoken faculty on the grounds that university employees have no free speech rights when it comes to criticizing their own institutions. This argument epitomizes Northeastern Illinois University's harassment of justice studies Professor Loretta Capeheart, who has been targeted by her administration for her outspokenness for workers' rights in a 2004 faculty strike, her activism against the Iraq war, her defense of student protesters, and her arguments for increased representation of minority scholars at NEIU. In retaliation, she was denied merited awards and an appointment to chair of her department -- a position to which she was elected. NEIU Vice President Melvin Terrell publicly defamed Professor Capeheart, accusing her, without grounds, of stalking a student. Professor Capeheart is suing Terrell for defamation, alongside NEIU's President and Provost for retaliation and violation of her constitutional right to free speech. Incredibly, the administrators' response argues that Professor Capeheart, as a state employee, may not sue the University or its officials, contravene their positions, question their conduct, or speak as a faculty member on matters of public concern. Unfortunately, the administration has frightening legal precedent, according to the AAUP. The Supreme Court's 2006 decision in Garcetti v. Ceballos held that state employees are not afforded first amendment protection if they are speaking on subjects relevant to their professional duties. When UC Irvine professor Juan Hong angered University administrators by opposing the replacement of tenure-track faculty by term lecturers, he was denied a merit salary increase. The Court ruled against Hong, citing Garcetti. In March, the U.S. District Court Judge of the Northern Illinois District agreed to hear Loretta's case, despite the university's arguments that it was "futile" for her to claim any right to free speech. She awaits this hearing. Supporters of Professor Capeheart ask that readers sign the petition supporting her at petitiononline.com/j4lc/petition.html. Please include your email in your signature comments for updates on the case. From the 1964 free speech movement to today's anti-occupation organizations, campuses have always been places where struggles for justice break out. This potential might explain why, losing ground in politics and the economy, the Right seeks to maintain its grip on outspoken faculty and students. David Horowitz, Laura Ingraham, the Association of College Trustees and Alumni, and the like have played their assigned roles in fostering a new McCarthyism that has given rise to a series of witch-hunts against both prominent and emerging critical scholars and activists. We cannot allow Zionism, racism, the attack on area studies and multiculturalism, or the violation of labor rights on our campuses to stand. We must call to account the administrations of Ithaca College, UCSB, The College of New Jersey, and Northeastern Illinois University. Professors Ramlal-Nankoe, Robinson, Rao, and Capeheart need your support. Their cases represent only a few of the many breaches of academic freedom coming to light in this moment. And we must fight on each and every one.